Package includes any combination of tickets up to 4. Let us plan your family vacation to Niagara Falls. You will be staying in the best hotel in Niagara Falls, enjoying the hotel benefits of the indoor pool, arcade room, spectacular views and more. Just pack the kids and let the Four Points by Sheraton Niagara Falls Fallsview Hotel handle the rest! 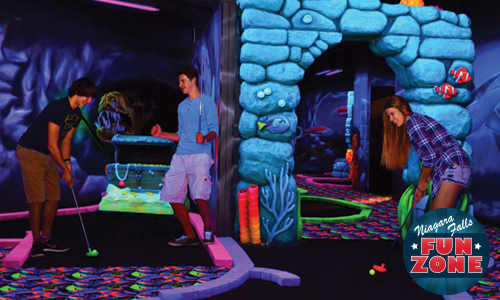 Play many of the hundreds of games at Niagara Falls Fun Zone, explore Niagara's famous attractions, or brave the halls of Niagara's spookiest haunted house! - Vouchers are not redeemable for cash, have no cash value, cannot be combined (alcohol and gratuity not included) and are dine-in only, one voucher per restaurant per stay, valid with purchase of two adult entrées. - Niagara Falls Fun Zone Facility Fee of $10 plus tax per person will be collected at the fun zone box office. Please bring your Niagara Falls Fun Zone vouchers to the desk inside of the Niagara Falls Fun Zone, located directly off Fallsview Blvd. (across from the Fallsview Casino).